It's important that these cookies be somewhat soft and tender, so don't roll them out too thick and don't over bake them. If you like, use a knive to imprint a design in the unbaked cookies, such as the crosshatch design in the ice cream cone above. Turn dough out onto counter, press into a disk and wrap with plastic wrap. Chill dough for 3 to 4 hours before rolling. Preheat oven to 350 degrees. Lightly dust counter with cocoa and roll dough out to 3/8 inch thickness. Cut with your favorite Ann Clark cookie cutters. Bake 8 to 10 minutes, until surface of cookies look dry and set. Let cookies cool slightly on cookie sheets ant transfer to a wire rack to cool completely. 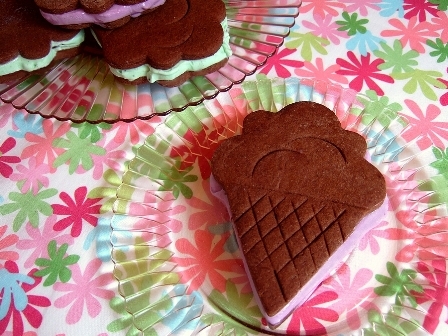 To make nine ice cream sandwiches, you'll need about 1 1/2 pints of your favorite ice cream. First soften the ice cream slightly. The best way to do this is to spoon it into the bowl of a standing electric mixer, then mix with the paddle until it has a smooth spreadable consistency. Working quickly, spoon about 1/4 cup ice cream onto the bottom side of the cookie and spread with a small spatula, then place a second cookie on top (right side up). Place the sandwiches in the freezer as you finish them. When they are completely frozen, you may wrap them in plastic wrap to store them.